Fresh Angeles: May You Be Blessed!! Need a little something to lift your spirits and make your day go better? Then here's the movie you need to see. 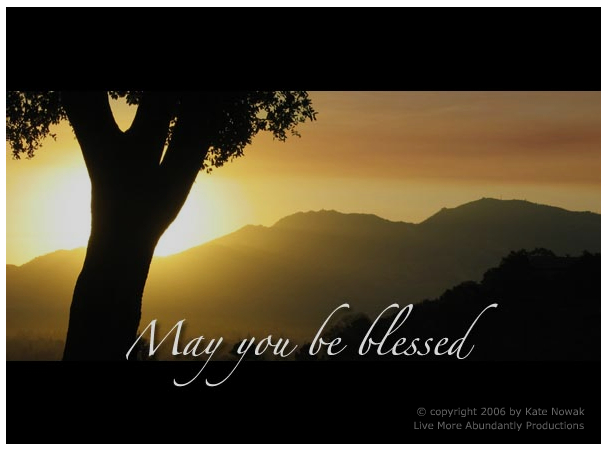 MAY YOU BE BLESSED is a short flash presentation currently being passed around the internet by emailers the world over. Officially launched on January 21, 2006, along with the One Million Blessings Experiment it inspired, both are the brainchild of writer/coach Kate Nowak. I was BLESSED by it & I hope you will be too! I read about this movie on Loni's Clubmom blog, entitled "Finding Joy In The Morning"